Did you play in the band in elementary, middle or high school? Do you believe participation in music has had a positive, lasting impact on you as an individual? Looking for a wonderful place to donate an unused instrument sitting in a storage closet or garage collecting dust? 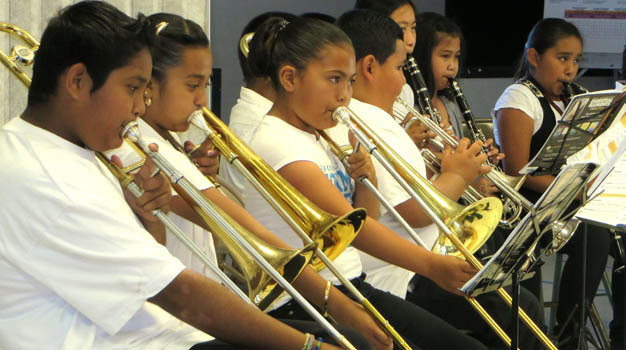 Why not donate your used instrument to San Jose Jazz’s pioneering youth development program, Progressions? Thanks to Progressions, under-served youth in San Jose are becoming part of a diverse learning community that empowers them to develop the resiliency skills necessary to thrive in the 21st century. We want to secure enough instruments to continue to expand the program to new schools in the Franklin-McKinley School District. Don’t have an instrument to donate? No problem. We also need financial support to offset the cost of refurbishing the instruments before they are issued to students. Make a contribution online now. Email Tom Langan at toml@sanjosejazz.org today, or drop off your donated instrument at the San Jose Jazz offices at 38 W Santa Clara St, San Jose, CA 95113. We are open Monday–Friday, 9am–4pm. In addition to the instruments listed above, we accept saxophones and trumpets, in any condition. If you work for a company, invite your colleagues to participate in a corporate challenge. You business will recognized for its efforts on behalf of the community and receive a personalized thank you from Progressions students. San Jose Jazz is a non-profit, exempt organization as described in Section 501(c)(3) of the Internal Revenue Code. All donations to San Jose Jazz serve to fund our education and performance programs in the community and are tax-deductible to the extent allowed by law.